What a great time it is to be a Spacemusician. Warping beyond the denouncements of Phaedra "originalists" (scolders of the opinion that everything produced post Phaedra is mere mimicry) outfits like Redshift, Free System Projekt, Node and Arc do not even think about winning over these critics. 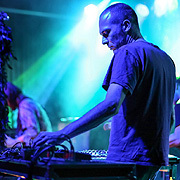 By carefully exploiting the intrinsic technological limits of 1970s Electronic Music they enlarge the medium's expressive range and prove this genre is an organism that continues to grow and change with each new manifestation. Taking its place nicely among the aforementioned Cosmic Ground is the self-titled debut CD by Dirk Jan Müller and has the feel of an album someone needed to get out of his system. Previously part of the prog-rock group "Electric Orange" Müller adopted the dark, as opposed to being born into it. 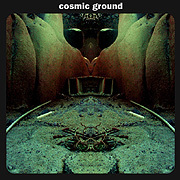 Cosmic Ground presents music from another time and place - and really takes us there. In a transcendent plunge into darkness the listener becomes swallowed up in Mellotron stringed soundtracks and layers of portentous synthesizer drones. The momentum shifts out of this ominous territory with propulsive bristling fervor as tumbling sequencer patterns motor on in echoing perfection. The notes brighten, darken, modulate, add and subtract in a futuristic syncopated minimalism Space fans have been fascinated with for decades. With Cosmic Ground we are listening to someone with a real passion for sound and atmosphere. However far lost in The Universe he is Cosmic Ground offers a committed performance from Müller - one of uncanny vibrancy. Today's artists hope to elevate the Spacemusic experience to one of mystical proportions - as they continue to push this sound as far as it can go.